Although I’ve made great progress in the direction that I’m headed in life, I found myself in a place of frustration. Busy. But I had to ask myself, are all the things that have consumed my time and my thoughts of great importance or am I putting the allotted time into every obligation that I have. I’ve never been as social as I’ve become. So I began to do more of the more enjoyable things in life than the things that are most important. I’ve also put more energy into one project rather than give all the equal energy that’s needed. Between my relationship with God, work, wanting to further employment and education, my home life, my writing, more than one leadership position, social life, and other responsibilities, I somehow got lost in balancing each aspect of my life. I created a plan where I could be able to balance it all, but I somehow got distracted and became overwhelmed. I say this too often to find myself in this position, but in all things there must be a balance. 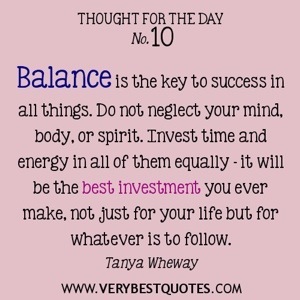 In life we have to learn to balance our priorities as well as the enjoyable moments in life. Allowing one to outweigh the next knocks us off. It can put us in an uncomfortable position. However, it isn’t unusual for one to fall off balance. It happens. But we can’t allow it to keep us there. When there’s no balance in our lives, we can become stressed. And I’ve found myself in a place of stress. Things in my life have been in disarray. And I’ve begin to realize over the past few days that it will never be in order if I don’t make the choice to try to balance it all a little better. Putting those things that are of greater importance is the start of a healthy balanced life. It’s great to have fun and enjoy life, but taking care of responsibilities is just as important. We have to make space and time for it all without one of the two overtaking us. Making a plan and a schedule is a way to help keep a healthy balanced life. Writing out your responsibilities as well as the fun and exciting things in life that you enjoy. And if you find yourself becoming distracted, try your best to find where the imbalance is and fix it. I’ll be honest and say, I didn’t do that right away. I allowed it to overtake me. But I had to realize that there would be no change if I didn’t make a decision. So I encourage you to try to live balanced life to avoid unnecessary stress. If things seem to get out of order, find it and nip it in the bud. Create a way to better balance your time and most importantly your life. Get out of the Way: you Never Know who you’re Reaching.